This battery works with many Hitachi and Panasonic camcorders. 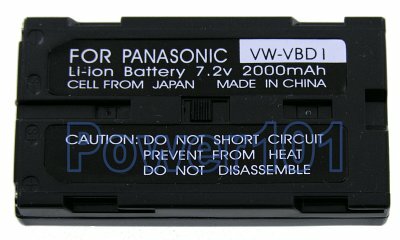 Panasonic PV-SD4090, NV-EX1B, PV-SD5000, PV-DV700, PV-D1000, PV-DV710, NV-DJ1, PV-DV1000, EZ-1P, NV-DX100, AG-EZ1, GA-EZ20, Hitachi VM-945LA, VM-E340A, VM-645LA, VM-E530A, VM-E535LA, VM-D865LA, VM-E635LA, VM-H100LA, VM-H755LA, VM-E455LA, VM-E555LA, VM-E645LA, VM-H945LA, VM-H955LA, VM-D965LA, VM-E465LA, VM-H650A, VM-H835LA, VM-H855LA and many others. Please check our camcorder compatibility list to find the battery you need. 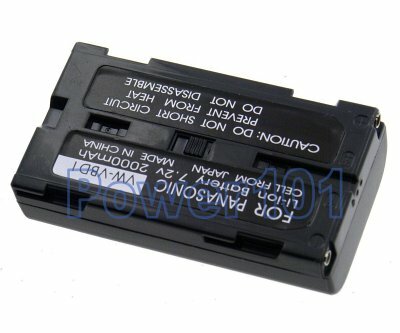 These batteries can be charged by any standard chargers compatible with Panasonic VBD1, Hitachi BPL13 or JVC BN-V812. Such as the charger that came with your camcorder. They can also be charged on the camcorder.